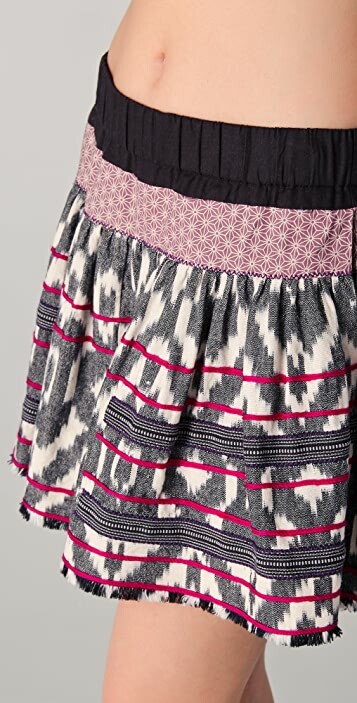 This cotton miniskirt features contrast embroidery and an ikat pattern. Geometric-print trim and solid elastic waistband. On-seam hip pockets and frayed bottom hem. Designer Sunjoo Moon began her career in Paris, where she worked at several European fashion houses before launching an eponymous label and, later, Of Two Minds. Drawing inspiration from that stint in Paris and combining it with a Californian aesthetic, Of Two Minds blends the essence of Malibu with the urban sophistication of Saint-Germain-des-Pres. Each piece is designed to be worn dressed up or down, lending a breezy duality to the collection and proving two minds really are better than one.